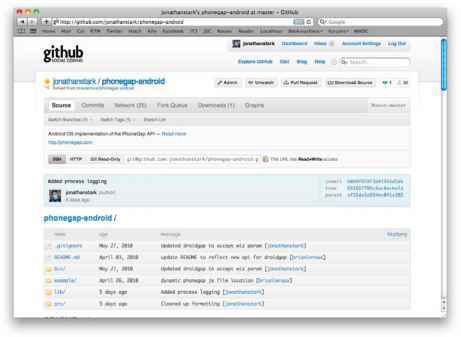 Now that we have the Android SDK installed, we can use PhoneGap to create an Android project based on our web app. To ensure the instructions in this book will continue to work long into the future, I have forked the main phonegap-android project and intend to keep a relatively static version. Once you become comfortable using my version of PhoneGap for your Android development, you might want to visit the main page for the PhoneGap project to see if there is anything new and exciting that you might want to incorporate into your apps. 1. Navigate to the Android PhoneGap download page on GitHub and click the Download Source button in the top right under the Search box (Figure 7-5). 2. When prompted to select an archive format, click on the big .zip icon. The download graphic will stay open even after the file has been downloaded. 3. Unzip the downloaded archive to whichever directory you like. I'm going to put mine on the desktop and rename the unzipped SDK directory to "PhoneGap" for the sake of simplicity.